The .45 ACP shotshell (r.) has the basic profile of .45 ACP Ball (l.) to increase the chances it will cycle through a semi-auto. 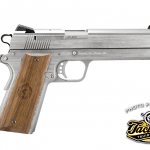 If you handload and shoot a .45 Auto, RCBS has a fun set of dies in its special order catalog that lets you use cut-down .308 Win. 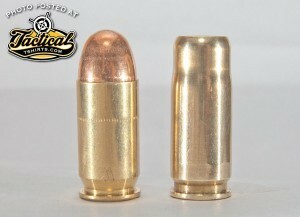 cases to make .45 ACP shotshells. Your average gunshop will probably have never heard of this die set, but the RCBS item number is 56552. 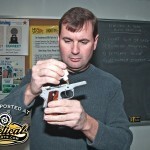 When I got my set years ago, the instructions were simply an old American Rifleman article by C.E. Harris who came up with the idea for the dies. Basically, you lube a .308 case, run it up into a cutting die, hack off the part sticking out using a hack saw, then file the top edge smooth. It’s easier than it sounds. With your new case, you just prime, load the powder, then the shot charge, and roll crimp—much like a regular roll crimp shotshell. I’ve made and used these shells for years—mostly for fun stuff like shooting carpenter bees as they fly out of the eves of an old cabin my wife and I frequent—and have some tips if you give them a try. 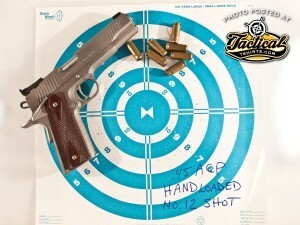 First, use .410 wads as your shotcups. 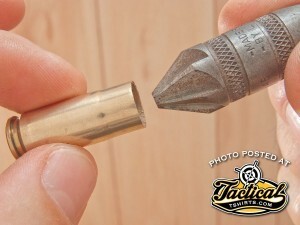 Ballistic Products offers several types including one they call “Stump” that you can cut in half to make two short wads. 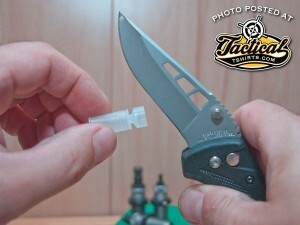 Another tip is to use liquid Alox bullet lube to seal your crimp. The instructions call for using an overshot card cut out of stiff cardboard, but instead of any overshot card at all, I simply squirt the Alox into the mouth of the crimp. It hardens around all of the pellets so they don’t leak out and when you fire your shot the pellets separate from the Alox. It’s not uncommon for the primers to back out slightly, which isn’t a problem with a semi-auto, but if you’re shooting these in a .45 ACP revolver like a S&W 1917, can lock up the gun. 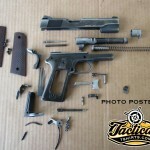 When you fire any cartridge, the primer backs out a little before being reseated as the case slams back against the breechface. These cases may not slam back hard enough to reseat the primer, so you have to keep the primers from backing out in the first place by slightly enlarging the flash hole in the bottom of the primer pocket. Conventional wisdom suggests that if you can make these cases from .308, you can also make them from .30-’06—but you can’t. The extractor groove on the .308 is cut at the same angle as the .45 ACP, but the groove on the .30-’06 is different, so you’ll get unreliable extraction. 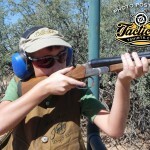 Even with the right cases, you may not get reliable semi-auto function using the shotshells because the mouth of the case may open into the chamber’s throat. If that’s the case, you have to hand cycle each shot, which to me, is a minor annoyance when shooting bees, dragonflies or grasshoppers. This load keeps all of its pellets in a 12-inch circle at 15 feet making it effective for challenging aerial targets such as hand-thrown Ritz crackers. 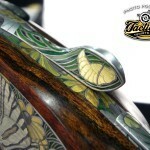 Cutting this .410 wad in two offers the handloader the option of a long or short “brush” wad. 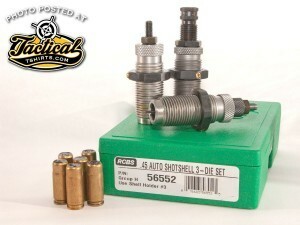 RCBS offers a special order die set to load .45 ACP shotshells. 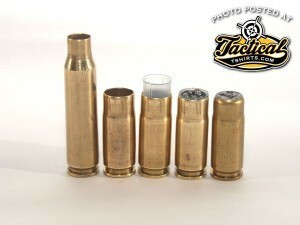 The steps for making .45 ACP shotshells are (l. to r.) cut the .308 case down, prime and drop the powder charge, insert the shotcup and fill with shot, crimp and seal with liquid Alox bullet lube. After pressing the .308 Win. 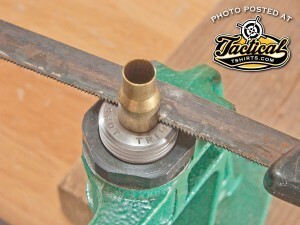 case into the forming die, cut off the extra with a hack saw and finish with a file. Chamfer the ragged edges of the freshly formed and cut case before continuing to load.